I’ve written before that F.J.K.’s “If You End Up Broke” is one of my favorite recordings from the pre-video era of Busk Break, and four years into the project, that’s still true. One reason for this is something that I wasn’t able to appreciate at the time I recorded it: It’s a terrible song for busking. In general, if you’re going to make money playing tunes to people walking by on their way to somewhere else, it pays to go with something bright, high-energy and recognizable. F.J.K.’s “If You End Up Broke” is none of those. It’s a melancholy tune on the surface, but the lyrics are surprisingly mellow and hopeful. That’s not the kind of subtlety most passersby are likely to notice. 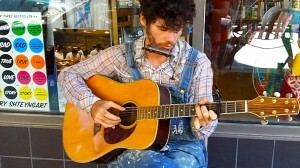 One of the most exciting things about Busk Break is revisiting performers over the years. Some performers start off stilted and awkward, borderline terrified of playing on the streets and only agreeing to be recorded after a heavy bribe in their empty tip jars. A year later, those same musicians have often evolved into confident, charismatic, corner-owning rock stars. That doesn’t always happen, of course. In some cases, there wasn’t much that needed improvement in the first place. That was definitely true if F.J.K. I first met F.J.K. in the pre-video days of Busk Break (the spring and summer of 2010), and his performance persona was already well established. He was confident enough, if a little awkward in casual conversation. He was seemingly ambivalent about being recorded, but perfectly happy to take my money. 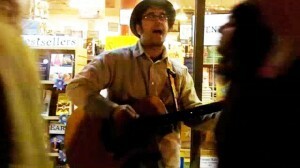 He played an original, “If You End Up Broke,” which is easily one of the best songs I recorded in 2010. In many ways, the fall of 2010 was the defining year for the busking scene in downtown Asheville. 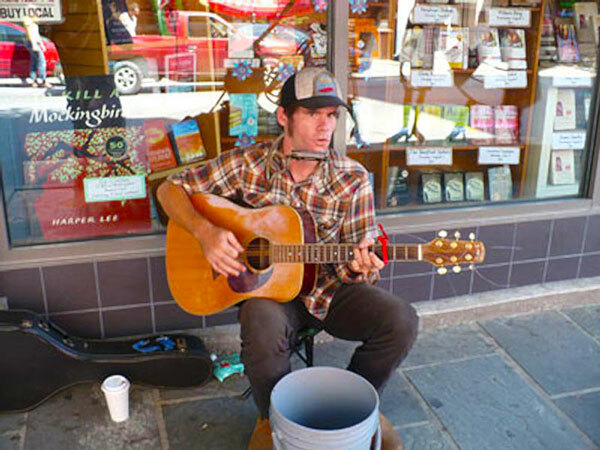 While street performers were hardly unknown in the city, a number of factors combined during that season to put Asheville on the map for traveling musicians that year. One of those factors was the first Asheville MoogFest, which brought a wealth of national-level electronic musicians to an already music-crazed city during Halloween weekend. Where there’s people and foot traffic, there will be buskers.